It was Llandudno’s final home game of the 2017/18 season against Barry Town United, and it was also club stalwart Lee Thomas’ final game at home for Llandudno FC after 15 years’ service. The weather recognised the occasion and Llandudno got things underway following a guard of honour for Lee Thomas. Llandudno started brightly and there was attacking talent all over the park today with a strong midfield and forward three, and it was deep lying Danny Hughes who produced the first shot on goal after only 4 minutes as he struck a shot sweetly from 25 yards that was heading towards the top corner, only for Mike Lewis to somehow not only save the ball, but keep hold of it as it stuck to his gloves. After 10 minutes on the clock the fans nearly got what everybody wanted as Lee Thomas headed in at the near post, but the linesman judged him to be offside and the celebrations were cut short! Just a couple of minutes later it was another Llandudno header that was nearly celebrated, this time coming from Marc Williams who got on to the end of a delivery in the box, but the ball went agonisingly wide. It was Marc again with the next opportunity on goal, but Lewis saved really well and fortunately the forward was deemed offside with just over half of the first half played. The chances dried up then for the remainder of the half and Barry Town began to get in to the game more as the half progressed, without causing Rutter in goal any trouble, but both teams went in square at the break. Barry began the second half similar to how they ended the first and had Llandudno on the back foot for the opening minutes, before eventually breaking the deadlock through Jonathan Hood on the 53rd minute who lofted the ball over Paddy Rutter from the edge of the box. Barry nearly doubled their lead shortly after when Kayne McLaggon hit a great free kick at goal, only for Paddy Rutter to pull off a great save to keep the deficit to one. On the hour mark Llandudno had a scramble in Barry Town’s box, and after Marc Williams tried to direct it at goal it’s bundled behind by Luke Cooper for a Barry own goal and the scores level. 1-1. Llandudno were only able to remain level for just 6 minutes as Barry’s captain James Saddler slotted home from a tight angle past Rutter after being played in. 1-2. With 75 minutes on the clock Lee Thomas nearly got his moment again with him completely free in front of goal and is picked out well for a header at goal, but he heads wide and misses a great chance to sign off his final home game with a goal. From the miss Barry Town go up the other end of the pitch and Hood bags his second bundling in at the far post to make it 3-1 to Barry Town United. Llandudno are still battling and David Thompson has the next opportunity for the Seasiders as his header back across goal just couldn’t find the far corner and it goes out for a goal kick. With 4 minutes left on the clock Marc Williams flicks on a delivery cleverly towards goal that forces Lewis to tip over reacting well to the pace on the ball. From the resulting corner Danny Shaw manages to head in from close range for his 6th goal of the season and pull it back to 2-3 with 2 minutes of normal time left to be played. 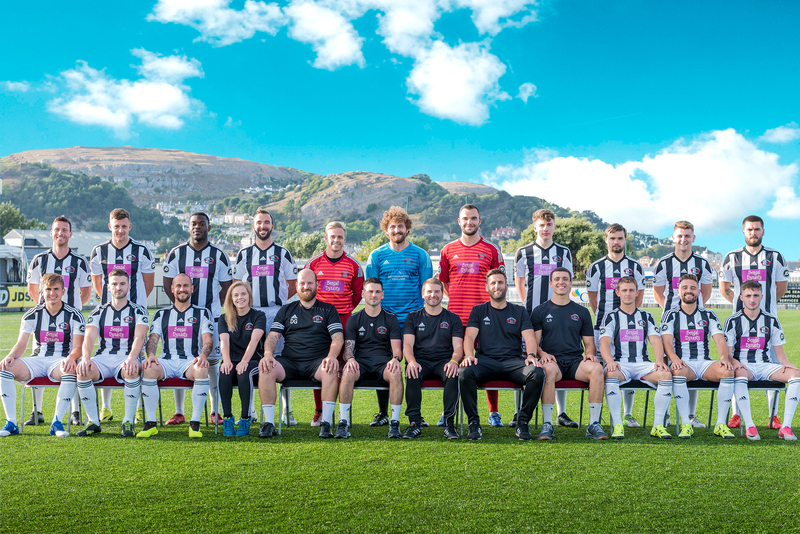 Llandudno thought they’d found a late equaliser in stoppage time when a Toby Jones free kick took a deflection off the wall, but the ball flew towards the top corner as a result but Lewis again with a save to deny the goal, and that was the last action of the game.